When it’s freezing outside and inside, put chunky socks on and insert your feet into these comfy clog slip-ins! Oversized, made special to wear with socks, easy to slip on and off! The slippers are well-fitted, with instructions for how to shape soles for right/left slipper. Same instruction for all sizes, only changing hook-size to achieve 3 different sizes, Small, Medium and Large. Thinner/thicker yarn, and/or smaller/larger hook, will create in-between sizes. 10 pages written instructions, full stitch-diagram, step-by-step-pics and tutorials. or Chunky/5, or any yarn obtaining the gauge info in instruction. About 100-150 g (3.6 - 4 oz), depending on size. See images on this page. 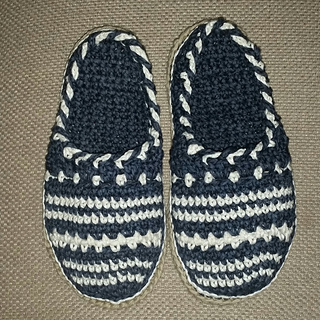 Joining Crochet Soles or Cord Soles to the bottom will extend the lifetime of your slippers, protect them against wear and tear and make them more comfy, warm and sturdy! Inserting tailored insoles, will add extra comfort and softness to the slippers. It looks nice, and keeps the slippers in shape. Personalize the insoles with pretty fabric and labels! A very good gift-idea! 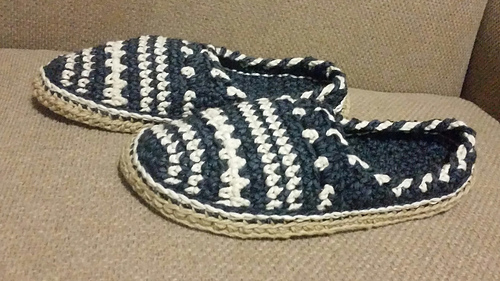 Joining out- and insoles to your crochet-slippers, you’ll achieve a pair of long-lasting, warm, and extra sturdy home-shoes! E-BOOK with CORD Soles HERE. E-Book with Crochet Soles HERE. I offer pattern-assistance and welcome any question you might have. You are welcome to sell the finished product made from this pattern! All my patterns are copyrighted. By purchasing an item from my shop, you agree not to copy, distribute, give away or resell the design, in print, or as a digital file. Thank you, and happy crocheting! !